Snow drought is about to end, a little snow on Friday, a lot possible over the weekend. We really haven’t had that much snow recently, the seasonal average is catching up to this Winter’s snow pace. However, it looks like this year’s snow will start pulling away again over the next week. The first of two storms will move through on Friday with generally light snow. It will start during the pre-dawn hours and taper off early in the afternoon. 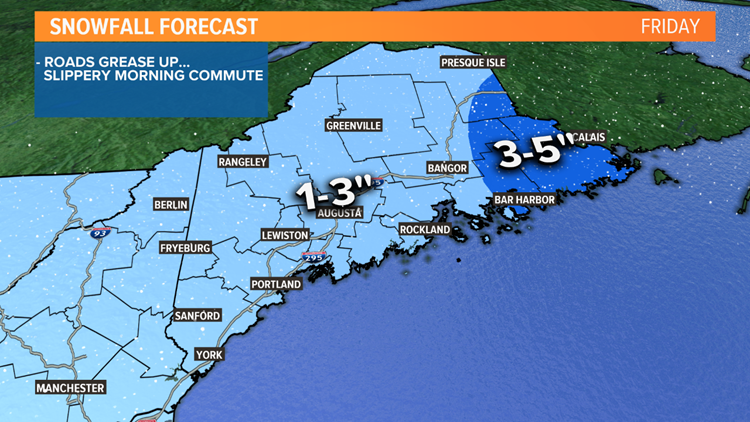 It won’t be a lot, generally 1-3”, The Downeast Coast will see a bit more, 3-5”. Timing won’t be great, with greasy roads expected for the morning commute. The second storm has potential to be a high impact event. High pressure will be locked in to our north with the Arctic air supply. 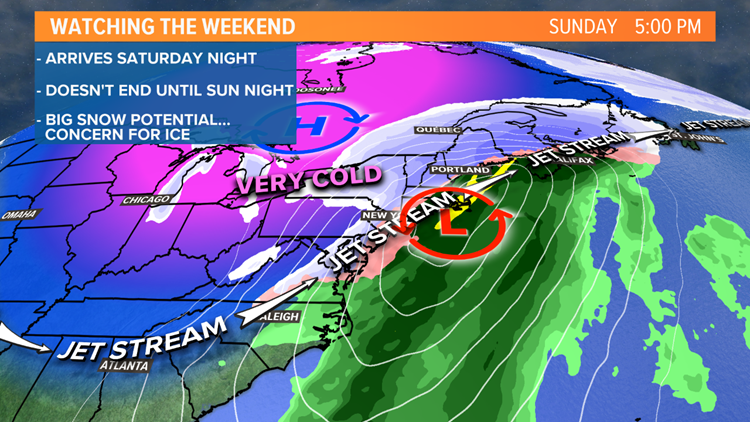 The digging Jetstream will guide warmth and moisture north up the East Coast. This will turn into an efficient winter precipitation maker lasting almost 24 hours. 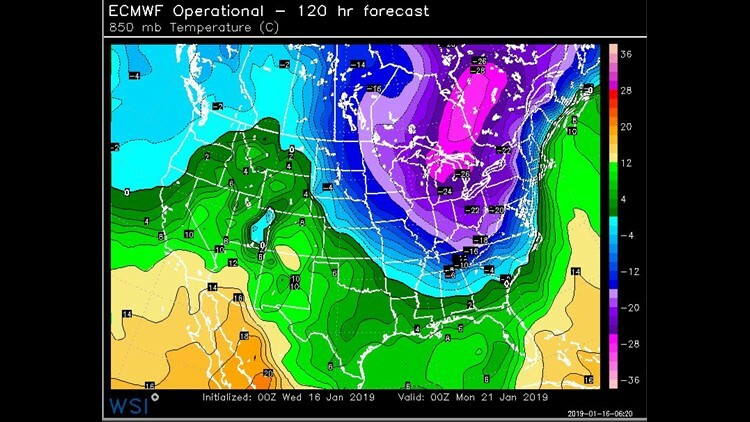 There will be an insane thermal gradient, from 50 F over the Gulf of Maine to -15 F in Southern Canada. A temperature change like this means the stakes are high and precipitation type can be an animal to predict. My hunch is, the Arctic air preceding the storm will be so entrenched that dislodging it will be extremely tough. Cold air damming usually wins out in these situations and I expect it to be victorious again. If there is any warming it to be aloft near or over the coastal plain. This means that along with snow, ice could be a player, both sleet and freezing rain. 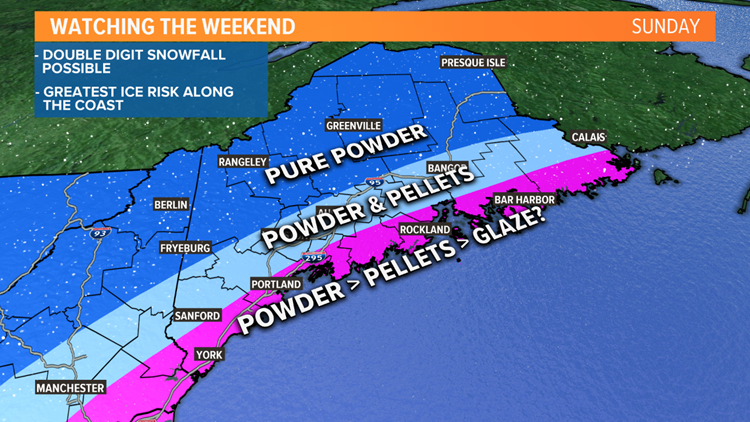 Below are my early thoughts on how the storm will play out. It’s still too early for snow amounts but there’s potential for double digits across the entire State. How much ice mixes in is the big question.